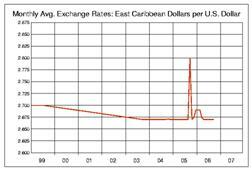 The East Caribbean dollar (currency code XCD) is the currency of eight members of the Organisation of Eastern Caribbean States. It has existed since 1965 and is normally abbreviated with the dollar sign $, or alternatively EC$ to distinguish it from other dollar-denominated currencies. It EC$ is divided into 100 cents. The dollar is pegged to the United States dollar at USD 1 = XCD 2.7 since 1976. Six of the members using the XCD are independent states: Antigua and Barbuda, Dominica, Grenada, Saint Kitts and Nevis, Saint Lucia, and Saint Vincent and the Grenadines. The other two are British overseas territories: Anguilla and Montserrat. 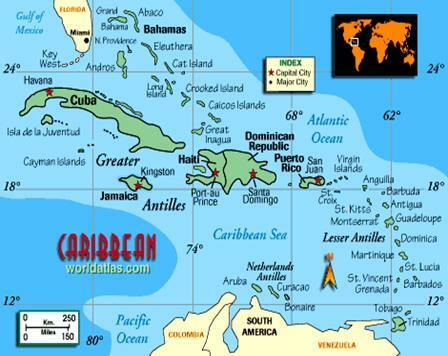 The only OECS member state not using the Eastern Caribbean dollar is British Virgin Islands, which uses the U.S. dollar. The Eastern Caribbean dollar is issued by the Eastern Caribbean Central Bank based in Saint Kitts and Nevis. The bank was established by an agreement (the Eastern Caribbean Central Bank Agreement) signed at Port of Spain on July 5, 1983, as successor to the Eastern Caribbean Currency Authority. The currency replaced the British West Indian dollar, used by the extinct West Indies Federation. ECCB (Eastern Caribbean Central Bank) exchange all notes (1983+), and either the notes issued by the two previous banks : ECCA (East Caribbean Currency Authority) (1965-83) and BCCB (British Caribbean Currency Board)(1950-65). You can see on the next pictures some of these notes.